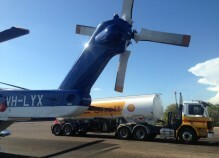 Aerodrome Management Services provides refuelling services to aerodromes and airports throughout Australia. Refuelling of aircraft is a technical business and at some aerodromes AMS has also assumed the role of manager for the aircraft refuelling section of the aerodrome. Our personnel work with all the major fuelling companies. We can also accommodate private refuelling arrangements. Our refuellers are fully qualified and experienced and adhere to the highest industry and safety standards when performing refuelling duties.